Disclosure: mifold Grab-n-Go Booster was received from the company for review purposes only. All thoughts and words are those of the writer and no payment was made to endorse items(s) and/or service(s). Opinions stated are genuine, and those of the author. Using super tough plastic polymers and aircraft grade aluminium, top designers, engineers and industry experts together have created mifold – now we are ready to Grab-and-Go! “It’s 10x smaller and just as safe” Safety claim based on mifold’s compliance with car safety regulations for child restraint systems in different territories. See our FAQs for specific details of the territories in which mifold is compliant with local regulations. 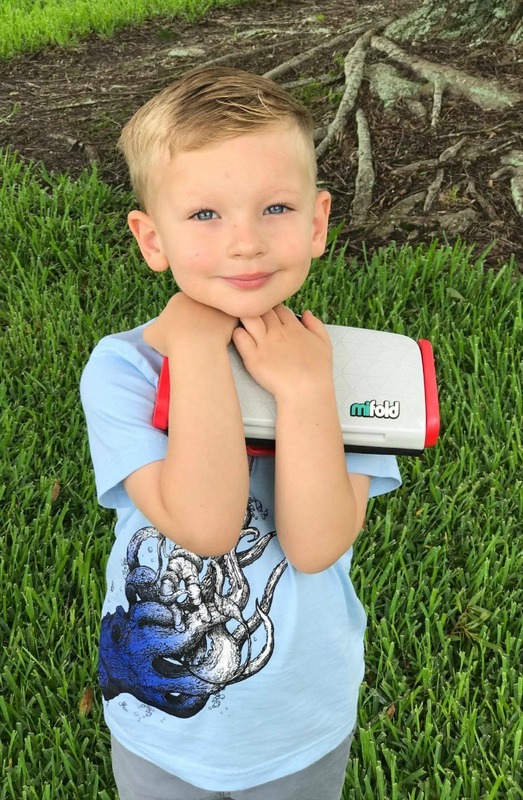 When I received the mifold Grab-n-Go Booster to review, my husband claimed it immediately . He loves that he can now always have a seat for our pre-schooler in his car, that doesn’t take up half of the back seat and can be neatly stowed away in the glove compartment box! Being able to stash the booster, inside the car, opens a whole new world for working fathers on the go. It means going from shuttling around a car full of clients to the school pick up line, as easy as 1-2-3. No extra stops to grab a booster that was removed to make room. It works so well, and is so convenient, the grandparent’s want one for their car too. It is amazing that it is so safe for our son, yet so lightweight and easy to use. And messy spills are no issue…just clean with soap and water. No need to remove bulky covers. How does the mifold Grab-n-Go Booster work? A regular booster lifts a child to be in the position of an adult. mifold does the exact opposite … instead of lifting the child up, it holds the seatbelt down … it’s that simple. mifold is engineered to protect children from the age of 4 all the way up to 12. Check it out for yourself or the father in your child’s life…You’ll be so glad that you did!